Heat oven to 350°F. Spray 2 mini muffin pans with cooking spray. In 2- to 3-quart saucepan, heat evaporated milk, hot water, macaroni and salt to boiling over high heat. Reduce heat to medium; cook 7 to 9 minutes, stirring frequently, until pasta is tender and liquid is almost gone. Remove from heat; stir in cheese until melted, then bacon. Add more salt to taste, if desired. Meanwhile, unroll crescent dough on work surface; create 4 rectangles by pressing diagonal seams together. Cut each rectangle in half the long way, then make 2 perpendicular cuts in each, creating a total of 24 smaller rectangles. Place 1 of the small rectangles in each muffin cup. 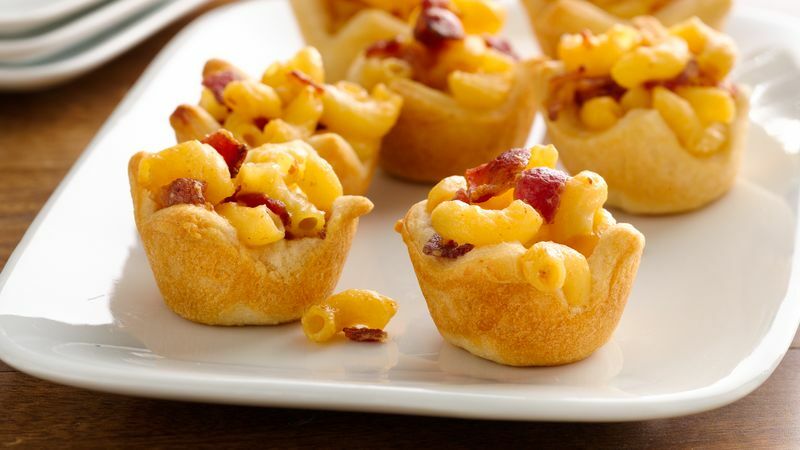 Spoon a heaping tablespoonful of pasta mixture into each muffin cup. Bake 14 to 16 minutes or until crescent bases are golden brown, lifting crescent base with fork if necessary to check colour. Cool 5 minutes, then remove from muffin cups with fork. Stir, stir, stir! The one-pot pasta filling is a snap to make, but it requires attentive stirring.